The six foot-something high wire fence marking the international border between Israel and Syria near the ‘Shouting Hill’ at Majdal Shams in the north Golan wasn’t the only boundary to be breached this week. International reactions to the pre-planned and coordinated violent agitprop staged on May 15th on all of Israel’s borders indicate the extent to which some have lost sight of reality. 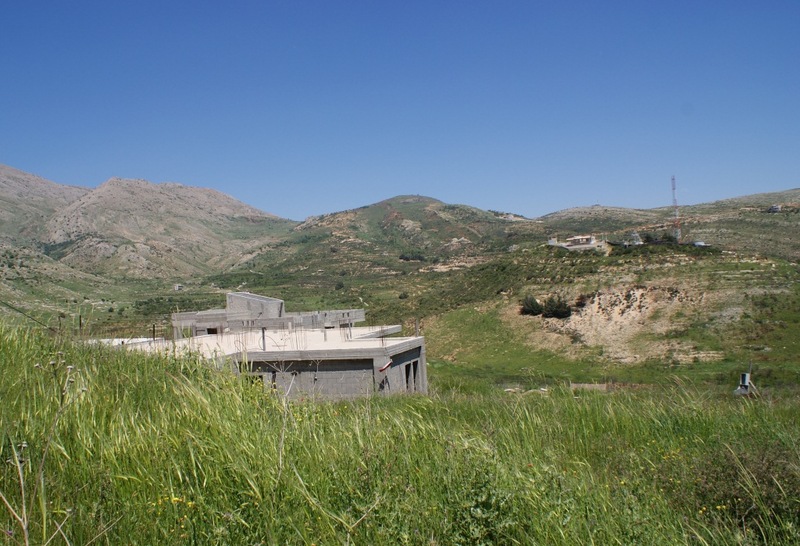 The 'Shouting Hill' at Majdal Shams – site of Sunday's border infiltration. As documented on CiF Watch, the Guardian’s coverage of the incidents was predictably lacking in both accurate information and balance. The cherry on top came, however, in the form of an emotional outpouring from American-born Karma Nabulsi on May 19th. Prior to her academic career at the UK’s Oxford University, Nabulsi was of course a PLO representative in Beirut, Tunis and London, as well as at the United Nations, between the years 1977 and 1990. She was an advisory member of the Palestinian delegation to the peace talks in Washington in 1991- 1993 and she is a patron of the murkily-funded Palestine Solidarity Campaign and an advisor to Badil . Like the veteran propagandist that she is, Nabulsi carefully edits her words to promote maximum gut reaction from her readers, whilst deftly skimming over inconvenient facts. No mention from her as to why the Golan Heights are under Israeli control after the years of Syrian attacks and two wars were launched from that area. No reference to the reasons why 30% of the Palestinians in Syria are still kept in refugee camps, or why there is state-engineered discrimination against them in so many fields or why, under Syrian law, they remain the only Arabs not allowed Syrian citizenship. Nabulsi’s rapid descent into the highly emotive language of refugees “going home” after having “lived each day since 1948 in the emergency crisis of a catastrophe” ignores what should be one very uncomfortable fact. It is precisely Nabulsi and her comrades in the Fatah leadership who, for their own reasons of power grasping and personal profit, have – in the 47 years since the establishment of the PLO – cynically exploited the Palestinian people and actively prevented their rehabilitation. Nabulsi knows perfectly well that her claims of “7 million stateless refugees” do not align with the fact that at least half that number currently live under the autonomous Palestinian rule of either the PA or Hamas and many others – like herself – live in Western countries. She also knows that the “world’s largest refugee problem” is a situation deliberately engineered by the decades-old politically motivated refusal of Arab countries to accommodate those refugees and the fact that the Palestinians have the exclusive distinction of being the only refugees in the world to pass that status on from generation to generation. But of course it is entirely transparent that the hand-wringing Nabulsi, with her comfortable academic perch in the Western world, cares nothing for the actual refugees themselves. If she did, she would have been campaigning for years against the discrimination they endure at the hands of their Arab ‘brothers’. In the long and well-entrenched tradition of the PLO, Nabulsi merely uses the plight of those less fortunate and less connected or well-placed than herself as a political tool on her way to her real aim – the destruction of Israel. And she doesn’t care how many poor Palestinian Syrians she has to sacrifice in the process; in fact in this article, she positively glorifies the type of irresponsible and illegal actions which are likely to lead to even more loss of life. Her disingenuous claim that this was some sort of catastrophe-induced spontaneous uprising is belied by the fact that it is already well-known that Hizbollah was behind the demonstrations both on the Syrian and Lebanese borders, as was reported both in the Lebanese press and by Hizbollah itself shortly after the riots began. Equally absurd is Nabulsi’s claim that the rioters “didn’t know what was about to happen to them” as they began to illegally tear down a border fence separating two countries at war. Not only must the infiltrators have had a very good idea of what to expect, but so did the organisers of the stunt and its cheerleaders such as Nabulsi. But for them, poor Palestinians are expendable and their deaths are only ammunition in the propaganda war conducted from the safety of a far- away academic shrine or a well-guarded concrete bunker. According to the ‘Sherwood dictum’ to which we were introduced this week, editors apparently must agree with the opinions expressed in articles they print. One must therefore ask if Alan Rusbridger, like Karma Nabulsi, is in favour of the sacrifice of poverty-stricken Palestinian residents of Arab countries (in which they suffer severe discrimination) in pointless kamikaze-style agitprop engineered by terrorist organisations and their supporters as a way to avoid orderly negotiations. Given the ever-emerging picture of the Guardian’s shift from news reporter to political activist, not least as clarified by its role in the ‘Palestine Papers’ affair and the recent preposterous outbursts from its Jerusalem correspondent, one would not be surprised in the least if the answer to that question was affirmative. But in that, the Guardian would not be alone; another formerly respected organisation which is increasingly departing from its original mission in favour of blatant political activism is Amnesty International, which produced a hasty and decidedly bizarre statement the day after the May 15th events in which it “called on the Israeli government to launch a full, impartial and independent investigation into the Israeli military’s use of force yesterday against Palestinian and Arab demonstrators”. To CAMERA’s able analysis of the AI statement one can add that it is significant that no call is issued for an impartial investigation into the as yet unexplained failure of the UN forces deployed on the Israeli-Syrian border to intervene when hundreds of people crossed the buffer zone between the two borders – despite the fact that UNDOF has an outpost only metres away from the site of the incident and its main headquarters are situated a mere 15.3 kilometres away – a fifteen minute or so drive at the most on the relatively quiet roads of the Golan. 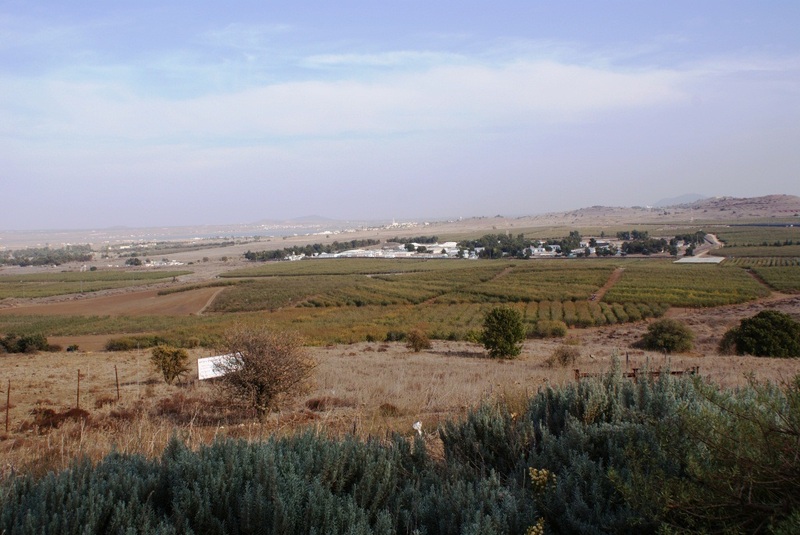 Main UNDOF camp in the Golan Heights. Tragically, it seems that the sort of potentially fatal and obviously reckless actions which took place last Sunday on Israel’s borders draw encouragement from the type of irresponsible reporting as displayed in the Guardian and the ridiculous reaction of bodies such as Amnesty International and that a repeat event may even take place very soon. Israel will of course continue to defend its borders and its civilians from these unprovoked attacks staged by terrorist-sponsored mobs – just as any other country would do in similar circumstances. But interestingly, very few in the Western world appear to understand that their condoning of such attacks in fact sets a very dangerous precedent. If borders are fair game for any angry mob and illegal and forceful crossing of international boundaries by non-passport carrying infiltrators is to become the norm, then many countries, including Britain, have reason for concern. But of course if a group of angry Spaniards bust into Gibraltar waving unauthenticated claims to property and land there, that would be entirely different – wouldn’t it? Hi everyone, take a look at this link from a commenter (Ziontruth) on this very site, CiF Watch: http://cifwatch.com/2011/05/19/in-defense-of-geoffrey-alderman/#comment-47736. Let me excerpt from it: ‘it so happens that the Arabs covet what rightfully belongs to the Jews, so we hate them‘. Let’s be clear: that is racism pure and simple. There’s something very familiar about this idiot which readers from way back of the anti-Israel rubbish at the other place might recognise. It’s a certain way of being by Islamists and their supporting posters – ie their inability to stand up for their own arguments and the compulsion to call everyone in on their side along the lines of the “Hey everybody…” shloch above. It´s their modus operandi. They are just persecuting coward freaks. They just love to denounce and preach and then claimed abject victimhood. Alright. You have a bag o’ $2000 with you. I demand it from you, even using force to take it away from you. For my actions, you hate me. Therefore, you’re prejudiced, bigoted etc. toward me. Insanitary is in yet another of it´s fits of the Little Inner People´s High Commissar Syndrome, or a Torquemada alter-ego. Very typical of such marxoid types: they are motivated by an insatiable need of persecuting, denouncing and, when possible, exterminating other people. That´s the legacy of the left, from which the nazis learned their trade. Let us have you definitions of race and racism. That´s simple: anyone insanitary disagrees with, dislikes or threathens her/his/its 19th century marxoid fantasy-world. And yes, there’d be no nauseating and cloying pity for them of the Guardian and the loony left to feed into any exaggerated and warped sense of “gimme gimme” entitlement. And it may make the back pages of the world press but not for long. And your last paragraph is very appropriate. Where would be the line in the sand before a world hypnotised by the “poor Palestinians'” plight (99.9% of their own making) took action to end this lunacy? When the British owned Hong Kong, the mainland Chinese used to try coming across the border – sometimes hundreds a day. They were all pushed back or rounded up by Gurkhas wielding huge wooden batons and behind them, were other Gurkhas wielding machine guns. There was no international outcry. No-one was interested. This went on for years. So now you know exactly what Britain would do in Israel’s place. This is a concern for Italy as we speak–they badly want to turn away the Muslim hordes storming to their shores from Tunisia via Lampedusa, but they don’t know how to do it without incurring the wrath of the kangaroo court in the Hague. Israel’s problems aren’t unique, they’re just more acute because Israel’s surrounded by enemy states and because the anti-nationalists have a special animus toward Israel for being one of the last few nation-states on earth where national survivalism isn’t yet completely suppressed by anti-“racism” laws. ziontruth, it was reported yesterday by the BBC that 1 in 6 of British people are non-white. If we can assume temporarily – very clumsily – that non-white in Britain equates to non-Jewish in Israel we are creeping towards that 20% of people who are “different”. Despite how it seems the animus here is directed far more towards Islamisation and the exceptions made to lots of things to placate and/or appease Muslims than it is towards Jews or Israel. That does not of course apply to CiFers but to the “man in the street” who doesn’t read The Guardian, even online. I just wonder how Britain will have changed by the next census. The governments get increasingly far away from the people. That’s really good news, Ariadne. Thanks. There is hope for the free world yet. In fact, sometimes it seems only the Americans are still asleep on the switch.